Brain Booster Rating: 7 out of 10. One sweet potato meets your daily need for vitamin A and gets you a third of the vitamin C intake you need. Sweet potatoes are packed with fiber, which helps regulate your blood sugar and makes you feel fuller longer, enabling you to keep studying into the wee hours of the morning! On top of that, the lime juice adds an extra kick to keep your brain guessing. When my roommate asks if I want to get ice cream, I’ve been known to say, “Nah, but I could really go for a taco.” Needless to say, I’m definitely a salty over sweet kinda gal, which also means I love chips. But snacking on chips, especially when studying, is not always the best thing. Not only do most potato chips pack over 250 calories and 10 grams of fat in a mere 15 chips, but they’re also not so good for your focus (all you can think about is the next chip), which is why I’ve fallen in love with baked chips. Surprise, surprise, when you stop frying things, they become better for you! Next time you’re in the store, grab a bag of your favorite regular chips and compare them to their baked counterpart. I will warn you, however, once you’ve seen it, you can’t unsee it. 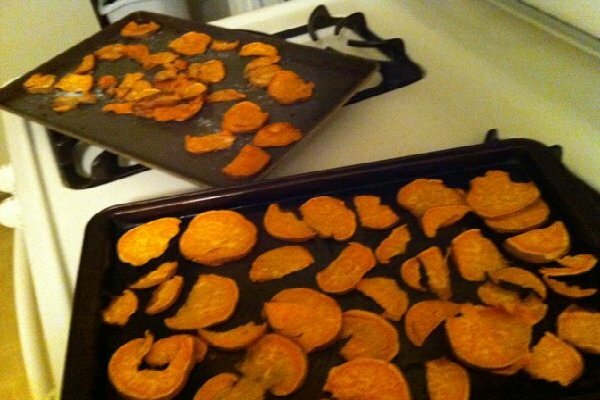 These homemade baked sweet potato chips are quick, easy, and won’t ruin your day of healthy eating as you pore over notes, textbooks, and powerpoint slides (with a little bit of internet surfing thrown in there) for hours on end. Just preheat your oven to 400 degrees, toss your sweet potato slices in a drizzle of olive oil, spread them on the pan and bake 10 minutes each side or until the edges brown and start curling. Squeeze some lime juice over the top, sprinkle with sea salt, and voila: study break time! Shannon Kelley is a graduate student at Truman State University in Kirksville, MO, and is a known night owl, indulging often in late-night study treats like these chips, Netflix, and the occasional Facebook chat conversation.